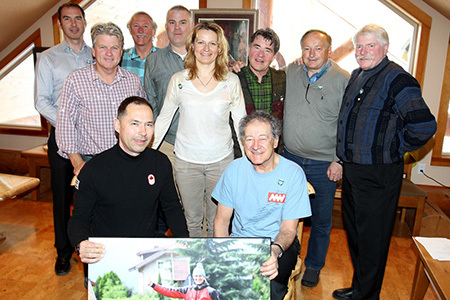 In March 1996, six friends, Mike Wiegele, Norm Crerar, Steve Podborski, Andy Aufschnaiter, Werner Schuh, and Rupert Huber, sat together in the Guide's Haus at Mike Wiegele Helicopter Skiing in Blue River. They talked about Bruderschaft St. Christoph, Austria and its history of helping people in and around the Arlberg Pass since the 14th century. The Bruderschaft St. Christoph is still very active - with over ten thousand members - and is still dedicated to helping people in need. 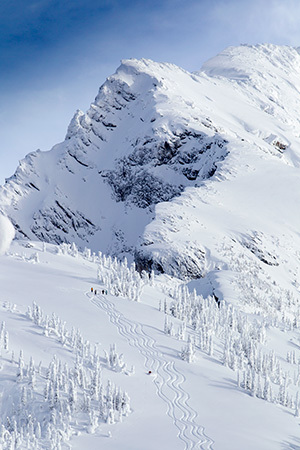 The six friends made a decision to start a similar organization for much the same purpose, sharing in a brotherhood/sisterhood with those who come to Blue River, BC to heli-ski, hike or live. These people obviously share a love of being with friends in the mountains. The charitable work and support of the local community through financial support has been evident since the creation and continues. To aim to be of assistance to those in critical short-term need, both individually and through the Bruderschaft Blue River organization. The current Chairman of Bruderschaft Friends Blue River Society is Neil MacGillivary of Edmonton, AB, Canada. The organization is open to men and women; membership is by invitation from a friend who sponsors the potential new member. A special ceremony, which includes our ceremonial sword and a glass of wine with our other Brüder and Schwestern, is held to invite applicants into the Bruderschaft. Monies collected stay in the community to assist those in need. The founding members comprise the executive group who have the right of final approval for financial matters, and for prospective members. All members of the Bruderschaft receive an annual newsletter. Contact us to learn more about how you can become a member. An initiation fee of $100 is required with annual dues of $75 due following the ski season in May. In addition, there is an opportunity to obtain a Lifetime Membership of $2000. The Bruderschaft Friends Blue River Society also accept Donations of any sum at any given time which are greatly appreciated. You can submit your payments to the Bruderschaft Friends Blue River Society by either Bank Cheque or Bank Wire.